Whatever happens for the Chicago Bulls in free agency, they want a shooter in this draft. 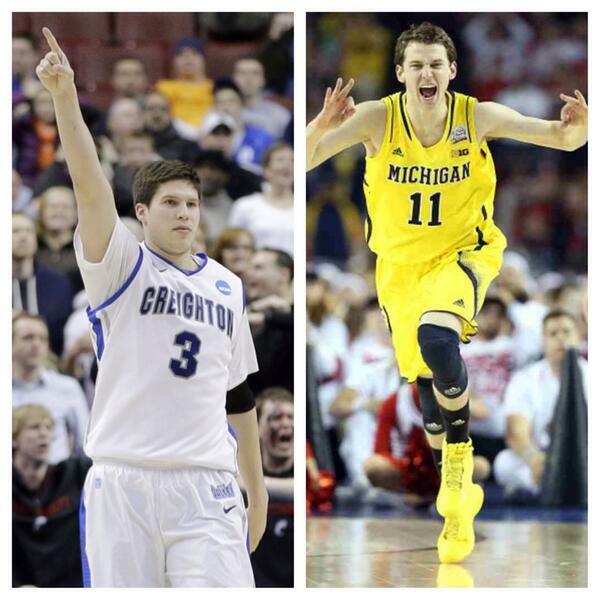 However, the two players they want – Doug McDermott coming out of Creighton and Nik Stauskas of Michigan will probably be taken before they get a chance to use their 16th and 19th overall selections. So the Bulls are trying to trade up and improve a team that has been one of the worst in the NBA when it comes to 3-point shooting since Kyle Korver left. Mike Dunleavy isn’t bad and Jimmy Butler is a very good shooter when his toe doesn’t bother him. However, the Bulls want that 40% 3-point player to come off the bench and give them some reliable catch-and-shoot options coming off screens. The Bulls are still very much into adding Caremlo Anthony for scoring purposes. LeBron James is also something of a dream for them. However, regardless of whether or not they manage to land the big fish in this year’s free agency swimming pool, the Bulls need to improve in their ability to create points and open up the floor with some outside shooting, something that might help a returning Derrick Rose quite a lot. Stauskas had an excellent sophomore season with Michigan, averaging 17.5 points per game while shooting 44.2% from beyond the arc. He won the Big Ten player of the year and was named as a consensus second team All-American. He is likely to be taken before the 11th pick, with Chad Ford’s most recent mock draft putting him at 10th going to the Philadelphia 76ers, who also have the third overall pick. McDermott had an incredible career in Omaha playing for his father at Creighton. He was the consensus national player of the year in 2014, being the NCAA’s scoring champion and winning the Big East player of the year. He is a three-time All-American. He averaged 26.7 points per game in his senior season, shooting 44.9% from beyond the arc. He won’t be as dominant in the pros, obviously, but his shooting and ability to score from everywhere makes him quite the prospect. Right now he’ll also go in the top 12, similar to the Sixers. The Charlotte Hornets need some shooting and might take him with the ninth overall pick. James Young and Gary Harris are also options that might be more likely to fall further down the draft and be available for the Bulls at 16th or even 19th. However, they prefer not to take any chances and see if anyone is willing to take two mid-first round picks for a top 10 one so the shooter they want doesn’t slip away.